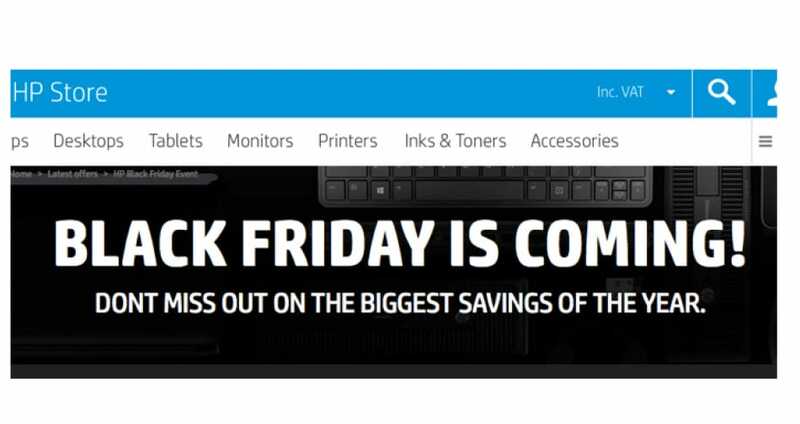 HP UK Black Friday deals are coming very soon where customers will be able to purchase laptops, desktops, printers, and tablets etc at knock down prices. All you need to do is bookmark this BFUK page and then sit back clicking the refresh button for any offers. We will be adding all the offers in our deals section and the comments below on this page as of when the HP Black Friday deals go live. Maybe you are after a laptop such as the HP Pavilion 15-p264na or the HP ENVY 13-d008na, or maybe it is the HP Spectre 13-4109na x360 you prefer. If a laptop is not for you then they have many computers such as the HP Pavilion 550-154na and many more, or if you need something a little smaller then what about the HP ENVY 8 Note 5001na tablet. There are so many HP products to choose from and when they get added to the Black Friday sales list we will be updating here on BFUK. The top deals will be listed here, but alternatively you can visit the official HP UK Black Friday Hub here. Hoping this will be cheap on Black Friday but at the moment the HP Pavilion 15-cc101na Laptop is on sale for just £899 instead of £998. The HP UK website is ticking away, the Black Friday countdown clock is now saying 9 days 13 hours, which gives us a date on 24th November. There are 9 deals on the Black Fiveday Event page and here are few of them you need to use the E-Vouchers listed. The HP UK Black Fiveday Event is now live, you have to use an E-Voucher to get your discount. The HP UK Black Friday 2016 countdown timer has been set and in 28 days time the biggest sale of the year will begin. TOP DEAL – Over on HP UK there is limited stock on the HP Pavilion 15-ab238na Laptop, be quick and buy now for just £399. Save £50 on the HP 11-p100na x360 Convertible Laptop. The price was £249 but now can be yours for only £199. Thanks to the Xmas special over at HP UK you can save £50 inc VAT, was £349 on the HP 15-ac005na Laptop where you need only pay £299. Sainsbury’s is only doing in store Black friday deals only and are offering the 14-inch HP Jack Black notebook for just £150 – Some stores may have this so we would recommend calling your local store first to see if they have this item in stock. The 10% saving is good for me because I am after a new tablet. The one i would very much like is the HP Pro Slate 8 Tablet which is priced at £360, so with a 10% saving that is not bad. Just got £100 off the HP 22 Touch AiO, it has 1TB HDD, 6GB RAM all for £349 after using the e-voucher BLACK100. Sainsbury’s will be selling the HP 14 Jack Black laptop with 32GB, Celeron and 2GB of RAM, which was £280 but will be selling for just £150 on Black Friday November 27th. There is a cool saving of just over £50 on the HP Pavilion x2 10-n054sa laptop, now only £199.97 via Currys online. Tesco is selling the HP 255 G3 laptop with the specs i like for £209, but will thins be cheaper in the Black Friday sale? All the USA ad scans / flyers will be officially releasing this month, but are they going to have ad flyers for the UK? Is HP UK having a whole week Black Friday sale, a weekend or just a one day sale? The new HP ENVY 8 Note 5001na tablet over on the HP UK website is priced at £359, will this be any cheaper on Black Friday? PLease do come forward and let us know.